In addition to the basic features that you will use in the Excel Web App, there are also some advanced features. In particular, you can work with formulas and functions, manipulate data, and even coauthor spreadsheets in real time in the cloud. One of the primary reasons for the popularity of Excel as a data analysis tool is the seemingly endless supply of functions. A function is a bit of logic that performs some calculation or manipulates data in a certain way. For example, you may want a cell to display the addition of two other cells. You can use a simple plus (+) sign to accomplish this addition. Going farther, however, you might want a cell to display the current time. You can use a function, such as Now(), which would display the current time. To enter a function in a cell, enter the equal (=) sign followed by the function. For example, to enter the Now() function, you type =Now(). After you finish entering the function and press Enter, you will see the current time rather than the =Now() function in the cell. This simple yet powerful functionality is what lets users create very valuable and complex spreadsheets with minimal training. If you are following along, notice that as you begin to type the function, the Excel Web App automatically starts to show you all the functions and narrows in on the list of possible functions as you continue typing. This feature is useful when you cannot remember the exact name of the function but remember it starts with a specific letter. 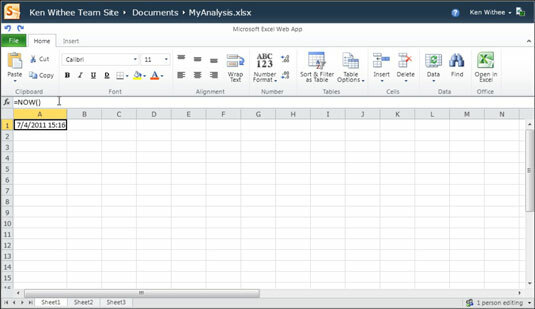 An excellent list of the available Excel Web App functions listed by category is available on the Microsoft Office website. The ability to manipulate data is a staple of Excel and continues in the Excel Web App. You can manipulate data by using functions or by creating your own formulas. Functions exist for manipulating numeric data and also text data. You can dynamically link the contents of a cell to other cells. For example, you might have a column for sales and a column for costs and then a third column that denotes profit by subtracting the costs column from the sales column. Using functions and mathematical equations, with nothing more than your web browser, you can quickly whip data into shape by using the Excel Web App. One of the exciting new features found in the Excel Web App is the ability to coauthor spreadsheets with others in real time and at the same time. For example, imagine that you are in Seattle and your colleague is in Manila. You can edit the same document in real time by using the browser. When your colleague enters text or numeric data, you see it appear on your screen. Coauthoring allows for a much more productive experience because you are both editing the same document, which maintains a single version of the truth. 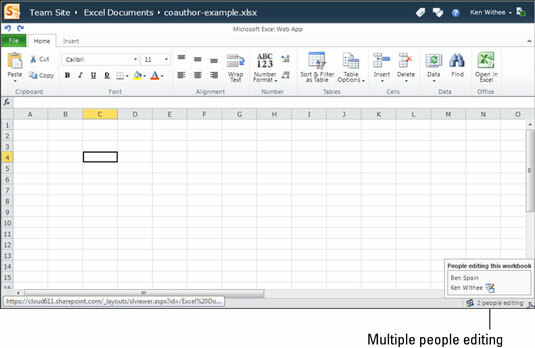 With a spreadsheet open in the Excel Web App, you can see the other users who are currently editing the document in the lower-right hand corner of the screen. For example, if two people are editing, you will see text that says “2 People Editing.” If you click on this text, you will see the two users who are currently editing the spreadsheet. When one of the users makes change to the document, everyone who is currently viewing the document will see the changes take place in their view as well. This turns out to be an extremely useful feature because the new changes do not have to be e-mailed to other people in order for them to see the most recent version of the spreadsheet. The spreadsheet only exists in one place, so there is only one version of the truth for this spreadsheet.